For All of the other field days where we have published the event please visit our history site here. There you will find all of the details of Field Days in years past. This is a brief history of the beginnings of the Loudoun Amateur Radio Group. Story by Norm Styer, AI2C. The roots or beginnings of the Loudoun Amateur Radio Group go back to 1993 when a group of radio amateurs, that frequently used the 147.300 Bluemont repeater, decided to participate in the ARRL Field Day activities in June of that year.The group decided to hold the Field Day activities at Gary Quinn’s farm in Lovettsville Virginia. The participants at this Field Day were George Cotton (KD4PWR), Tom Carney (WB9RXJ), Mark Gilliam (N3GMW Now W3MDG), Roy Clark (KC4YGB), David Bachschmid (KD4TWR), Gary Quinn (NC4S), and Jack Fastnaught (KD4UDX). The majority of the hams that participated in the Field Day activity at Gary’s farm had never done so before and it showed. 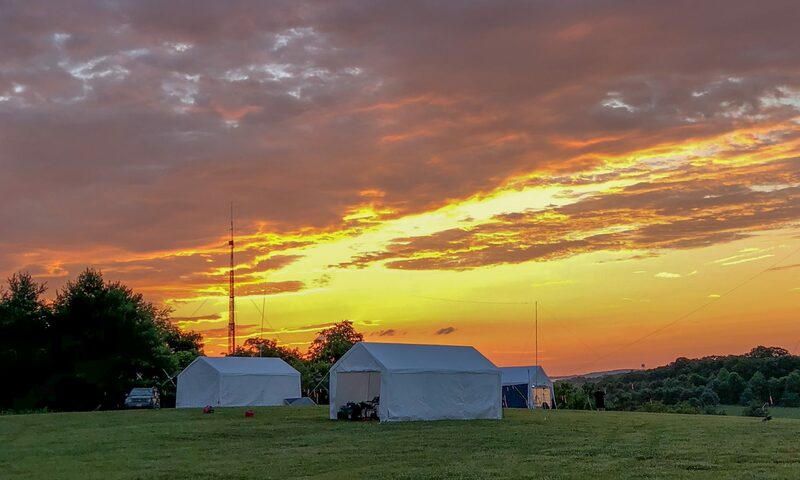 We managed to have a low score because of dipole antennas at 20 feet, generator that quit because of water in the gas, thunderstorms shutting down operations, bending a two-meter antenna support mast during its raising, and an HF vertical antenna that was not connected properly. Despite all of the mistakes poor weather, and low score the group had a lot of fun together. During the Field Day exercise, George Cotton and others discussed the fact that western Loudoun did not have a club and why not try to start one. The members of this Field Day group then decided to try to form a club. The first actionable idea was to see if there was any interest by amateurs in the Loudoun area. We held a meeting announced by word of mouth and contacts through the 147.300 (WA4TSC repeater). A small group gathered for breakfast at Fran’s restaurant in Purcellville in July of 1993. The gathering at that meeting decided to try to find a larger meeting place, set a date and time and meet again in two weeks. A second meeting occurred at Fran’s restaurant in Purcellville and at that gathering it was decided to hold a meeting at the Village Bakery and Cafeteria that was located at 1 Harrison Street S. E. We sent out flyers to amateurs listed in the FCC database as living in Loudoun County. The first meeting had a very good attendance and the decision was to have a meeting again on September 18, 1993 at the Village Bakery. The founding members at the first meeting were; KD4PWR, George Cotton, WA4TSC, Wes Boxwell, K4MSG, Paul Bock, N3GMW (now K4MDG), Mark Gilliam, KD4WFY (now NR4Z), Mark Rudolf, WB9RXJ, Tom Carney, W0PLX, Jack Spink, NC4S, Gary Quinn, W4HZV, Temp Titus, KK4GC Chris ?? ?, KD4LSL, Dale Cabaniss, KD4TWR, David Backschmid. The first club license (KF4BTQ) was issued July 17, 1995 to the current club trustee, NC4S Gary Quinn. The second club call (K4LRG) was issued February 12, 1997. The clubs first Field Day I believe occurred in 1995 at Ida Lee Park. The club scored 4,056 points with 989 Q’s and 14 people participated. When the club first started, we held meetings for breakfast at various places, such as El Rancho Plus, NC Barbeque, and the Hamilton Town Hall. When the Leesburg safety center (police station) was built, we held our meetings there for about two years.